1 So you got infected. Now what? It is possible to become a vampire in the game, which will open up eleven new quests and a few unique rewards and challenges. They are sometimes called blood vampires, to distinguish them from the unrelated ash vampires. Vampirism is considered a disease and is contracted from a vampire's bite. Be aware that there is no actual bite and that only melee combat counts (their spells can't transmit the disease). With each hit, you have a small chance of being infected. A good way to catch the initial condition Porphyric Hemophilia is to repeatedly search the body of a slain vampire. If you are immune to disease, like after being cured from Corprus, you're immune to this as well, unless you cast Weakness to Common Disease on self, preferably of 100 pt. magnitude. A list of all named vampires is found here; choose your Sire vampire carefully, as this will determine your bloodline and possible clan. So you got infected. Now what? Once you catch Porphyric Hemophilia, you can cure yourself with any form of Cure Common Disease, or see a healer or altar anytime within three days of being bitten. After the three days, however, you will wake up as a full-fledged vampire. You will know for sure you are a vampire by the dream that awakens you after the 72 hour incubation period expires. You receive a number of bonuses to your Attributes, Skills, and other abilities upon becoming a vampire, depending on which clan you are in. Your clan will be in the same bloodline as the vampire that bit you. +20 to Strength, Willpower, and Speed. +30 to Sneak, Athletics, Acrobatics, Hand-to-hand, Unarmored, Mysticism, Illusion, and Destruction. Immune to Paralysis and Common Disease. +50% Resistance to normal weapons. Vampire Touch spell, which Absorbs Health 10-30 points on touch. It will always have a 100% success rate. Aundae Clan: additional +20 to Willpower, Short Blade, Mysticism, and Destruction. Berne Clan: additional +20 to Agility, Sneak, Unarmored, and Hand-to-hand. Quarra Clan: additional +20 to Strength, Blunt Weapon, Hand-to-hand, and Heavy Armor. A few useful artifacts such as Eltonbrand, Spell Breaker and the Darksun Shield are only available as a vampire. 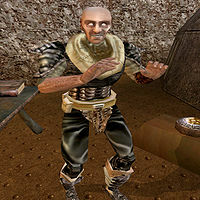 Eltonbrand is available without becoming a vampire with Morrowind Patch Project 1.6.4 or higher installed. There are disadvantages to becoming a vampire. Most of the disadvantages can be overcome with strategy, however. You do not regenerate health when you sleep (though fatigue and magicka recovery are unaffected). The only ways to regain health are via the Vampire Touch or any Absorb Health spell, or with Restore Health spells and items. Additionally, during daylight hours (6 a.m. until 8 p.m.), you will take Sun Damage up to 5 points per second, if you're outside. You'll either have to stay indoors for those hours or equip Constant Effect Restore Health items to counter the life drain. You'll also take increased (+ 50%) Fire Damage from spells and weapons and very few people will want to talk with you. Aside from the Mages Guild and House Telvanni, everyone will either shun you or try to kill you. This can make travel much more difficult, as boatmen, Guild Guides and Silt Strider caravaners will not transport you. It is also impossible to get any quests outside of the Vampire, Mages Guild, and House Telvanni Quests, as no one will talk to you to give you the quest. Many Daedric Quests are still available as well, because they do not require you to talk to someone to accept, merely to activate the shrine (except Mephala's Quest, which requires you talk to the priest). However, Boethiah's Quest is impossible to finish, as it requires you to talk to a person. Another major ramification is that the Main Quest is inaccessible unless you choose the Back Path, though this might ruin a good portion of the game for some people. Fortunately, there is a cure, though obscure and difficult to find. Once you take it you cannot become a vampire ever again. The simplest way to survive as a vampire is to complete clan quests and feed on cattle. However, joining a clan is not necessary to survive and it is entirely possible to live as a solitary hunter of the night. As most of the population will shun you, and some will even outright attack you, it is very difficult to survive in towns and cities. However, a vampire can easily maintain a low profile and exist on a farm, such as the Dren Plantation, collecting plants with restorative properties from the fields whenever possible. If you are feeling particularly dark, you may also find a hut or house in the wilderness and kill its owner in order to use it as your own base of operations and sanctuary from the sun. A more exciting existence as a vampire can be found by traveling the countryside and staying in ancestral tombs, Kwama mines, and caverns during the day and hunting, when needed, during the night, although this is primarily only a role-playing experience. The Armorer skill is very useful when playing as a vampire, as it is otherwise difficult to have your items repaired. Likewise, Enchant is useful because there are no vampire enchanting services, although Qorwynn, the Master Trainer of Enchantment, offers such services to vampires if you can talk to him. Speechcraft and Personality are also vital in order to live a more civilized life as a vampire. A high personality will allow you to bypass many of the attempts to shun you, and training your Speechcraft will aid you in raising the low dispositions that accompany vampirism. Being a vampire means that acquiring new spells, either by buying them or creating new ones yourself, is impossible. Make sure you have all the spells you need before becoming a vampire. There are three clans, or bloodlines, of vampires that you can be in the game: the Shadows of the Berne, the Mages of the Aundae, or the Warriors of the Quarra. You receive your bloodline from the siring vampire that infected you, yet that does not make you a member of a clan automatically. Though most vampires belong to one of the three bloodlines, there are five vampires that operate independently of the clans, and there are clan-less, generic vampires of no bloodline. Just because you're of their bloodline, don't expect a warm welcome. The members have low Disposition towards you, though they aren't hostile. Their leaders see you as an abomination, a freak mistake at best, and therefore expendable. You'll have to earn their trust and access to the clan's services by doing tasks of various kinds. Each clan has two quests which are offered only to its members (plus a generic third quest, "kill a dozen vampires of the rival clans"). There are also eight general quests open to members of any bloodline. Thus, you are limited to ten of the possible fourteen vampire quests in the game. Even if you complete all of a clan's quests, you can never actually join the faction and the clan will not appear as a faction in the character panel. Finding the clans and actually making your way to them for the first time can be one of the more difficult tasks in the game. There are few if any hints regarding their locations (with the exception of a Temple quest to kill Raxle Berne in Galom Daeus). There are three books, "Surfeit of Thieves", "Trap" and "Incident in Necrom", that hint at the existence of the Aundae, Berne and Quarra vampire clans, respectively, but not their locations (and no clan is in a location remotely resembling the book description). While you can use Almsivi and Divine Intervention to get to Dunmer temples or major Imperial Cult shrines, this is very limited in scope, especially since few of these are anywhere near the vampire clan hideouts. In fact, these travel tactics are more useful for getting somewhere else from the vampire lairs. Even travel via the Propylon Chamber network is dependent on actually having the right propylon indices, or the combined one from the Master Index expansion. Without that expansion to hint at their locations, actually finding the indices is itself difficult at best. Even with the expansion, it is best to have found all ten indices before becoming a vampire, since obtaining some of them normally involves dialogue with NPCs. For the Berne bloodline, find your way to Galom Daeus, a Dwemer citadel right out in the middle of Molag Amur, very close to a lava pit. They seem to be the best-off of the vampire clans: ten named members remain in the citadel, generic vampires of the bloodline hold three more Ancestral Tombs, and four named vampires of the bloodline have set up their own operations in ancestral tombs (although Raxle Berne himself wants one of them dead, another is wanted by the Quarra, and the third and fourth have been making themselves a good deal too conspicuous in the Grazelands – deliberately so, in one case). Perhaps it is by being the farthest from conventional civilization that they are in this position. The closest things to "civilized" landmarks anywhere near Galom Daeus are the Marandus stronghold (a considerable way to the southwest) and the Erabenimsun Ashlanders (an even greater distance south and east), although a new Telvanni lord (perhaps you) will at some point in the game set up the stronghold of Tel Uvirith at Uvirith's Grave not so far to the east. But then, the Telvanni are less hostile to vampires than most of the living are. The Quarra are closest to an actual Dunmer town, namely Khuul. They too have taken over a Dwemer citadel, that of Druscashti, almost directly to the east of Khuul just over the far side of the Foyada Bani-Dad (the entrance is in the Ashlands), and not too far southwest of the Urshilaku Ashlanders. Itinerant vampires, with no access to boat or silt strider systems, may well have more success finding their way there via the Dunmer citadel of Falasmaryon and heading northwest (do not confuse Druscashti with the other nearby Dwemer citadel of Bthungthumz). Neither Khuul nor the Urshilaku realize the danger they are in. However, the Quarra have been making enough waves to be found by wiser factions. Raxle Berne, in particular, knows where a dangerous Quarra rival is. So does a member of House Telvanni, Raven Omayn, who considers the "Blood of the Quarra Ancients" a thing worth capturing and studying. Only seven Quarra vampires, including Volrina herself, live within the citadel. Three more ancestral tombs are held by generic vampires of the bloodline. A fourth, named, independent Quarra – who has grown powerful enough to anger none other than Azura herself – lives within a tomb inside the Ghostfence. The Quarra have always been brave to the point of foolhardy, which may explain their low numbers. Still, the lack of a lore book mentioning them may reflect on them either being a clan more recently founded than the other two, or on their habit of leaving no survivors. The Aundae are perhaps the hardest to track down. Having left or been driven off the mainland entirely, unlike the other two clans, they do not have a Dwemer citadel at their disposal, nor the luxurious castle mentioned in "Surfeit of Thieves". Their lair of Ashmelech is a cave on a small island in the Sheogorad region. The only nearby usable landmarks are two heavily populated old Dunmer strongholds, both over the sea from the Aundae island: Valenvaryon on the mainland to the west, populated by heavily armed Orcs; and Rotheran on Sheogorad's largest island to the east, with a large outlaw population. Nine named Aundae vampires live within the cave. There are no other independent, named vampires of the Aundae bloodline. Generic ones are confined to three ancestral tombs. It is difficult to even get infected by the Aundae at all – the other clans both hold at least one or two tombs that are considerably closer to civilized towns that a casual adventurer might stumble across, whereas the three tombs held by the Aundae are all a good way away from civilization. The Boy Who Would Be Undead: Convince a young man in Ald'ruhn that Vampirism isn't all it's cracked up to be. The Quarra Amulet: Retrieve a number of ingredients for amulet making. First of all: it also works with timed Skill and Attribute fortifications, as long as they are active if you wake up and they are gone if you get healed. If a character has a constant-effect fortification for a vampire skill when they become a vampire, that skill will receive an extra permanent bonus fortification beyond the vampire bonus and the original enchantment. The extra fortification will not appear in the list of active effects, but the skill will be highlighted on the character screen even when no other fortification is present. The bonus can be several times the original enchantment. If the character is cured of vampirism and has the same item equipped, the skill will be damaged. If, however, the item is not equipped when the character is cured, part of the bonus fortification will remain permanently. If you plan to become a vampire, you can stockpile items with constant-effect skill fortifications to your clan's skills. Ideally, you can make variable-strength constant-effect items with a Fortify Skill spell and Enchant skill or the services of an enchanter and a good bit of gold. For example: A character with a 25 Unarmored skill enchants an Exquisite Ring with a constant 1-47 Fortify Unarmored effect and then equips it repeatedly to get a 45-point fortification to Unarmored. When that character becomes a vampire, their Unarmored skill can easily be more than 200. If they unequip the item and are cured of vampirism, they may have a permanent 30-point Unarmored fortification. This only applies to vampire skills, but it includes skills that receive clan bonuses (e.g. Short Blade for Aundae vampires). The bonus is like any other fortification except that it does not appear in the list of active bonuses. It affects the possibility and cost of training. It does not apply to advancement in factions. Because it does not appear in the list of active effects, and it cannot be removed, it can be difficult to know the actual strength of the effect and the natural value of a skill with this kind of bonus without keeping careful notes. with (I will call it) VampBonusMulitplier = (Skill + Vampire Bonus on Skill) / Skill. Detail: First if you become a vampire all the Skills get fortified by the VampBonusMultiplier. Your bonuses are multiplied too, but if you take the items out the game only subtracts the bonus they display. After cure the fortified VampBonusMultiplier is taken off. or have 78 of short blade, have 110 bonus to short blade, and be Aundae for 20 Vampire Bonus to short blade: VampBonusMultiplier = 98/78 = 1,256 After cure you have a 110 -(110/1,256) = 110 - 87,57 = 22,x =22 points permanent bonus so you have 100 short blade. or for extension: have 5 unarmored, be Berne and use all items for unarmored to have a 477 bonus then you have a Multiplier of 5 + 477 / 5 = 96,4 and get a 477 - (477/96,4) = 472 permanent bonus, to have 477 unarmored. The upper example for 25 unarmored skill works exactly if you are Berne-Clan. You will have a multiplier of 3 and if you are vampire and have the ring equipped you are at 210 unarmored. Since most NPCs will refuse to speak to you (some will attack if you even attempt to talk to them), and almost all quests and services become completely unavailable as a result, it is advisable to either become a vampire after you have finished every quest you plan on completing during your playthrough, or get cured immediately after quickly finishing all the vampire quests that you intend to do. It is very helpful to access the Propylon network for fast-travel, since other options are limited. This is even possible with the Master Index plugin, as the transportation is used by selecting a conversation topic, rather than using a service. You get the most over-all benefits from Clan Aundae, so if you are simply planning on temporarily becoming a vampire to do vampire quests, obtain the rewards and then cure yourself, it is advisable to make sure you are infected by an Aundae vampire. The other clan's quests get you nothing you can't obtain by normal means and without contracting vampirism (with the exception of the clan-specific teleport amulets, which quit working permanently after you are cured. ), but Aundae gives you access to The Vampire Hunter. This quest is the only way to obtain one of the best shields in the game, as well as an extremely powerful and unique mace. All of the other generic vampire quests are exactly the same regardless of your clan, so unless you plan on permanently remaining a vampire and want the stat boosts from a specific clan, Aundae is by far the best choice. The Boots of Blinding Speed help with the speed of your Levitation. Absorb Health weaponry and spells are very useful, given that you can't regain health through sleep. Sleeping or resting outdoors during daylight hours may result in your instant death. This is because you will take damage when exposed to sunlight. If you therefore rest outside in broad daylight and your health is not high enough to withstand the damage you receive during the number of hours you're asleep for, you will die in your sleep. Be sure to consult the time of day, and plan your movements accordingly. For example, start your quests at the onset of night hours (9pm to 5am). Any bounties and crimes against your factions will be held against you after you're cured. You can interact with most of Solstheim and Mournhold without them trying to kill you or shun you. Once you earn your clan's teleport amulet, you can use this to get yourself out of the Magas Volar Daedric Sanctuary (with Recall), if you're trying to claim a second Daedric Crescent. You can restore your health as a vampire by waiting in areas that are illegal to rest in. Make sure you are inside, though, or you may take sun damage if you don't time it right. If you are also a Werewolf and catch Vampirism you will turn into a werewolf with a bald backwards vampire head. Apart from the optical nuisance, there are several errors in Attribute calculations. This bug is fixed by the latest Bloodmoon patch. This page was last modified on 17 April 2019, at 21:37.